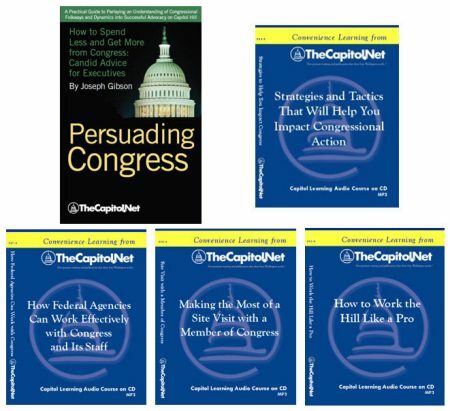 TheCapitol.Net Store Working With Congress Bundle: 4 Audio Courses on CD, plus "Persuading Congress"
Working With Congress Bundle: 4 Audio Courses on CD, plus "Persuading Congress"
SAVE More than $50 buying this bundle. 4 Capitol Learning Audio Courses on CD: MP3 format plays in all CD/DVD drives and many CD players, includes course materials. Total run time: 304 minutes. CD includes MP3 audio file and course materials in Adobe PDF. Includes FREE shipping, FREE copy of "Persuading Congress". These audio courses are sold with a limited license. After completing these audio courses, please complete the audio course evaluation.